A scene from one of the car plays to be performed on March 24 in the alley next to the Canoga Park farmers market. Photo courtesy of Doug Kaback. Members of the public can catch a glimpse of the ever-evolving stories of people who make up Canoga Park from the back seat of a car on Saturday, March 24, when the community premiers the Canoga Park Car Plays, a 10-minute-play festival that celebrates the area’s life and culture. California State University, Northridge faculty collaborated with the Valley Cultural Center and received a multidisciplinary Art Works grant from the National Endowment for the Arts to produce the Owensmouth Arts Nexus, a yearlong project that introduced arts programming throughout the Canoga Park community. 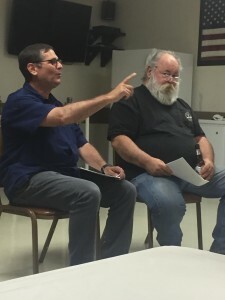 The project that culminates with the play festival and an art show in the alley that runs next to Canoga Park’s weekly farmers market near the West Valley Playhouse at 7242 Owensmouth St.
Doug Kaback, left, and Keith Long of the VFW post in Canoga Park at one of the playwriting workshops. Photo courtesy of Doug Kaback. NPA partnered with the Valley Culture Center to establish collaborations between CSUN art and theatre faculty and artists in the Canoga Park community to generate multidisciplinary art projects that strengthen the cultural infrastructure of the area. Many of Canoga Park’s more than 60,000 residents are low income and disenfranchised, Kaback noted. “They have few opportunities to take part in arts projects of this scale, nor get a chance to see their words come to life on stage,” he said. Art professor Curtis Taylor and his students worked with colleagues at the Canoga Park Youth Arts Center and the Boys & Girls Club to turn art created by young people at the centers into large, woodblock prints that will be on exhibit in the alley near the farmers market on March 24. 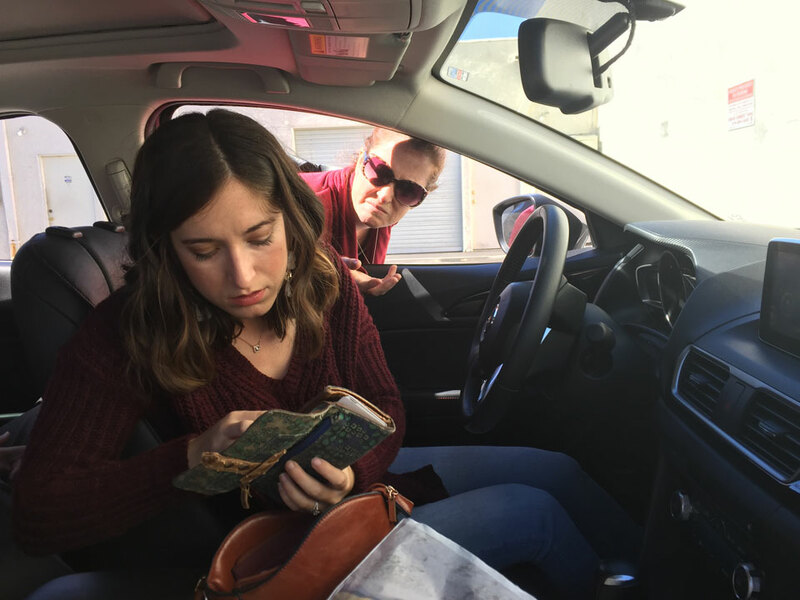 Kaback conducted free playwriting workshops in the fall and invited members of the community to develop 10-minute scripts that included two characters engaged in dialogue inside a car. The goal was to explore the themes of relationship, self-reliance and sustainability. Thirty plays were submitted and 10 were selected for production. Professional directors and actors, including a number of current and former CSUN theatre and cinema and television arts students, are part of the March 24 performance. Artists from Full Vision Arts Foundation captured the development of the art and theatre projects on film for the creation of a documentary on the collaboration. There will be two outdoor presentations of the plays on March 24, at 10 a.m. and 2 p.m., as part of the farmers market. A third performance will take place in the playhouse at 7 p.m. The large, woodblock prints will be moved from the alley and displayed in the playhouse’s lobby before and after the performance. For the outdoor productions, 10 cars will be lined up in the alley and audience members will be divided amongst the parked cars. In small groups, audience members will be ushered inside and around the vehicles to view the short performances, which are all set inside the cars. Car horns will sound at the end of 10 minutes and the audience members will move to the next car. For more information about the performances, visit the website www.cpcarplays.com.